CONTENTS: Preface; Introduction; The Field Studies; Ethical Issues; Working with the Language; Staying with the Mlabri, the Larger Group MI; Part I - Material and Social Culture; Names, Location and Number; Physical Characteristics; The Band, its Camp and Social Organisation; Mating, Marriage and Divorce (Ml); Kinship Terms; Naming System, Kinship Diagram, Preferred Modes of Marriage and Statistics (MI); Kinship Diagram, Naming System and Marriage Modes, M3 group; Economic Life, Tools, Arts and Daily Routine, MI Mlabri; Hunting and Gathering. M3 Group; Developments in the 20th Century, MI Group; Recent Developments; A National Park and a Refuge for Animals, Plants, Trees and the Mlabri. 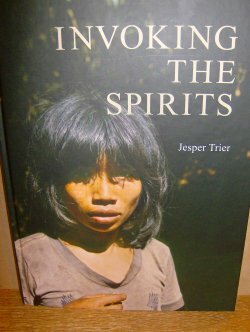 Part II - Supernatural World -- Thai Beliefs the Spiritual Heritage; The Souls of Newborn Children and of Sick Persons; The Soul after Death; The Mlabri Concepts of Souls and Spirits; Afterlife; The Other Spirits; Myths; Comparison with Bernatzik's Material. Part III - The Mlabri Language -- Word Formation and Syntax; Vocabulary. Part IV - The Prayers (M1 & M3) -- Definitions and Purposes; Prayers Invoking Several Spirits; Thunder, Wind, Rain, Hail and Rainbow; Snakes, Tigers, Swamps & Creepers; The Spear; Birth, Naming, Marriage and Divorce; Accidents and Illness; Burials; Deceased Parents and Others; Index.